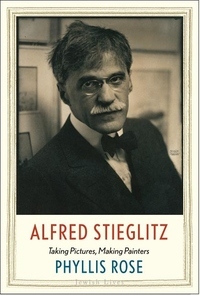 Alfred Stieglitz (1864-1946) was an enormously influential artist and nurturer of artists even though his accomplishments are often overshadowed by his role as Georgia O'Keeffe's husband. This new book from celebrated biographer Phyllis Rose reconsiders Stieglitz as a revolutionary force in the history of American art. Born in New Jersey, Stieglitz at age eighteen went to study in Germany, where his father, a wool merchant and painter, insisted he would get a proper education. After returning to America, he became one of the first American photographers to achieve international fame. By the time he was sixty, he gave up photography and devoted himself to selling and promoting art. His first gallery, 291, was the first American gallery to show works by Picasso, Rodin, Matisse, and other great European modernists. His galleries were not dealerships so much as open universities, where he introduced European modern art to Americans and nurtured an appreciation of American art among American artists.